We are SUPER excited to (finally) release our Wholesaling Inc Podcast, powered by Investor Grit! 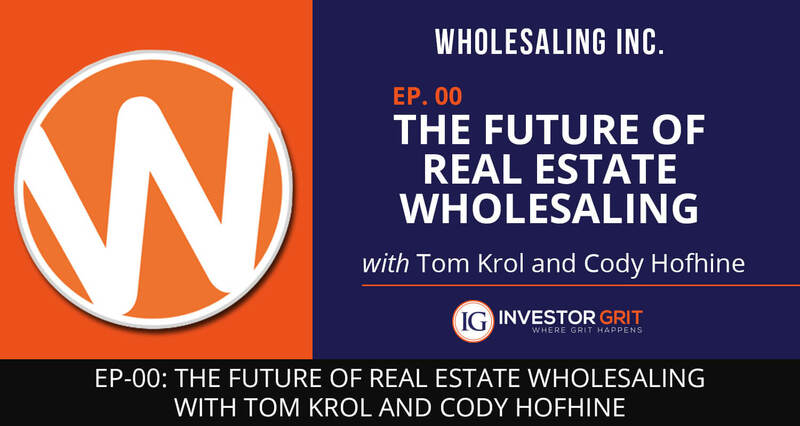 Americas #1 Wholesaling Coach, Tom Krol and former student turned 7 figure Wholesaler, Cody Hofhine have teamed up to bring you cutting edge, next level information on Wholesaling, Wholetailing and Flipping houses! Each week they will be bringing you up to the minute Wholesaling tactics and strategies that NO ONE else is sharing with one thing in mind, to help you EXPLODE your Real Estate investing business! This Podcast will provide you with a step by step “road map” that will help you CRUSH IT in your business. Be prepared to step out of your comfort zone and take MASSIVE action. It takes a lot of GRIT to make it in this business! Welcome to the NO FLUFF ZONE! For more great information on wholesaling, be sure to jump on our mailing list for all the latest tips, tactics and strategies on raising YOUR wholesaling game and CRUSHING it in your business! If you would like to join a tribe of Rhino’s and explode your wholesaling business, click on the coaching tab and book a call with us. If we like what you have to say and think you’re a good fit for our tribe, we might invite you in. Just know this: We only work with serious people and are very picky about who we let into our tribe. So to save your time and ours, don’t apply unless you’re awesome!